@ 220 VAC 50 Hz. RK-APG-1 12 SCFH/5 LPM .1 Amps @ 120 VAC 60 Hz. RK-APG-2 12 SCFH/5 LPM .2 Amps @ 120 VAC 60 Hz. 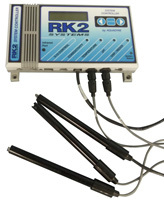 RK-APG-3 15 SCFH/7 LPM .31 Amps @ 120 VAC 60 Hz. Until now, performing even the simplest functions with a controller required technical or electronic expertise. The X Flo Systems - System Controller/ Monitor makes maintaining the optimum aquatic environment easy. Our X Flo Systems - system controller/ monitor is constructed with only the highest quality components. The heart of our system controller / monitor is an INTEL microprocessor which manages all of the activities of the controller gathered by the controller is processed digitally. 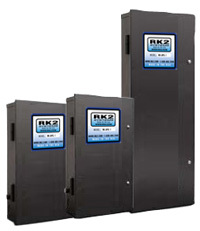 Our RK2 Systems controller/ monitor Architecture includes Digital Signal Processing (DSP) hardware and software that provides accurate and repeatable readings over the life of the System Controller. In addition, the microprocessor design provides unsurpassed flexibility, as reflected by the variety of the software options that are available for our control/monitoring system. 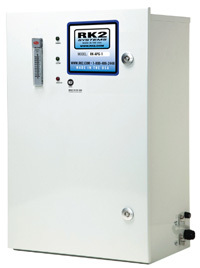 Continuous monitoring of conductivity, water temperature, pH and oxidation reduction potential (ORP). H2O/STM software with menu-driven programming environment. Auxiliary Input supports power failure, water level or pressure alarming. FLASH memory that makes upgrading with your System Controller with new H2O/STM software a simple task. Local audible alarm or optional remote dial-up pager alarm capability. Parameter control capability for management of peripheral equipment such as pumps and lighting. Powerful data logging capability that holds up to 7-days of probe data. Operates on 9V AC or on an optional 9V DC battery backup. Optional X-10 support for up to 255 control outputs. An infrared Data Port that supports an optional hand-held HP printer for data reporting and graphical analysis. Single communication port supporting both direct connection to a PC or remote modem communication.